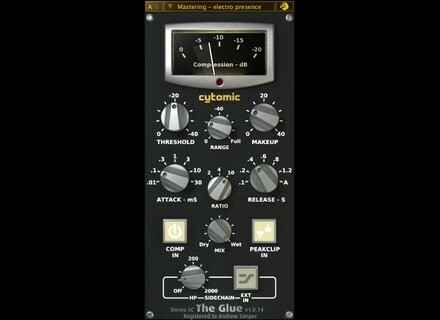 The Glue, Software compressor from Cytomic. Cytomic has released The Glue, an analog modeled plug-in based on a cross between an E and G series SSL 4000 buss compressor with some additional features. It uses the same algorithms used in circuit simulation packages but optimised for real time use, the company says. Additions include an attack time of up to 0.01mS and a Range knob designed to back off the compression to give natural sounding attacks and to limit the maximum amount of compression applied. Also included are external sidechain support and an adjustable sidechain highpass filter. Accurate analog model of an SSL 4000 buss compressor. Attack time of up to 0.01 mS.
Gain reduction meter (dB) 0 to -20. Threshold (dB): 0 to -40. Range (dB): 0 to Full (-oo). Makeup (dB): 0 to 40. Attack (mS): 0.01, 0.1, 0.3, 1, 3, 10, 30. Release (S): 0.1, 0.2, 0.4, 0.6, 0.8, 1.2, Auto. Compression In (Switch): On, Off. Mix (%): Dry 0 to Wet 100. Peak Clip (Switch): On, Off. Side-chain HP (Hz): Off, 20 to 2000. External Side-chain In (Switch): On, Off. Priced at $99, The Glue is available now as a VST effect plug-in for Windows and VST, AU and RTAS effect plug-ins for Mac OS X Universal Binary. An RTAS version for Windows will follow soon. AcmeBarGig Tater Head AcmeBarGig recently released Mr. Tater Head, the last release in the "Preampus Classic Hybrid" line of free amp VST effect plug-ins for Windows. RML Labs Updates Its Plug-Ins RML Labs has released updates for SAWStudio (v4.9), SAWStudioLite (v4.9), Studio Reverb (v1.7) and Studio Levelizer (v3.3). TC Electronic X8 Sonnox Edition PowerCore X8 is designed for high-end production environments where unsurpassed quality and processing capabilities are required, TC Electronic says.